There are some smells that immediately bring me back to my childhood. The rose scent of the “Love Beauty and Plant” Murumuru Butter and Rose” takes me back ‘up home’ to my grandmother’s house where I spent many afternoons swinging in the hammock reading a favourite book next to her wild rose bush. The “Love Beauty and Plant” Murumuru Butter and Rose” is a rose scented shampoo created for colour treated hair. My hair is tends to be on the oily side and is very straight and fine. It can be difficult to find a shampoo that doesn’t leave my hair feeling limp and unmanageable. The “Love Beauty and Plant” Murumuru Butter and Rose” leaves my hair shiny and feeling moisturized without feeling “heavy”. My hair is left with a beautiful soft rose scent, that I love. I was unable to locate it this product on the Skin Deep Cosmetics Database, a site recommended to me by our Naturopath to learn more about the ingredients in the products I am using. I searched some of the ingredients and discovered that some are rated 5 and above on their list which means the ingredients are a moderate to high risk according to their database. I do like that it is made with no Silicones, Parabens or Dyes. The company’s goal is to leave as small of a carbon footprint on the earth that they can. 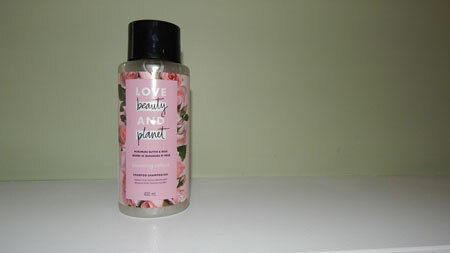 With that in mind they have packaged their body wash in 100% recycled bottles and use natural and ethically sourced oils and ,. Their caps and pumps aren’t made from recycled plastics yet, but they are working on it. The scent is the one thing that really stands out on this product. Often rose scents can make you feel “old” but this has a distinctly refreshing scent and this very feminine and fresh. The “Love Beauty and Plant” Murumuru Butter and Rose” helps me relax after a long day. The scent brings to mind some of my happiest childhood memories. *Disclosure: I received a complimentary bottle of “Love Beauty and Plant” Murumuru Butter and Rose” through the Amazon Vine Program in exchange for my review. All opinions are 100% my own.